After his historic victory on election night last November, I warned LRC readers of the dark parallel between Napoleon Bonaparte and Donald Trump. Men of destiny often know from a very early age what direction their life paths will follow. They are men of singular vision and not like other men. They are workaholics, totally focused upon fulfilling their dreams of greatness. 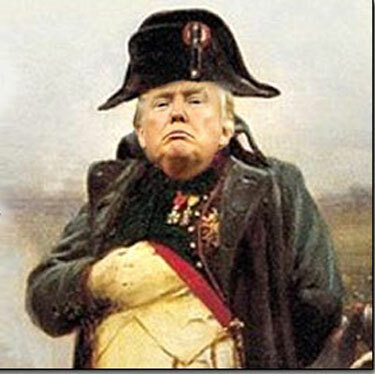 Both Napoleon Bonaparte and Donald Trump quickly arose through the ranks of their chosen professions. One in the military, a genius who transformed the martial art of war. The other in the world of business, a genius who perfected the art of the deal. The one word which describes Donald Trump’s leadership style, persona, and approach to governance is Bonapartistism, a political movement associated chiefly with authoritarian rule usually by a charismatic leader ostensibly supported by a popular mandate. Declaring that “I am my own strategist,” Trump is jettisoning the key advisors such as chief strategist Steve Bannon which created the historic electoral coalition of America First populist nationalists which placed him office. Like Napoleon, he is relying upon on gross nepotism and intimate counsel from family members inexperienced in the affairs of state. In addition he is increasingly deferring to a coterie of warmongering generals and neocon geo-strategists. Disaster looms at every corner. Watch this instructive biography of Napoleon Bonaparte and reflect upon its central cautionary message, the danger of hubris and arrogance of power. Napoleon rose to be the greatest and most significant figure of the 19th Century, but suffered the greatest and most significant fall from power. Lord Acton’s famous dictum, “power tends to corrupt, and absolute power corrupts absolutely,” was never more fitting than when applied to Bonaparte. In November I asked that in the unforeseeable future, let us each pray that it will not also apply to the Bonapartist Trump. Every day the damning evidence is becoming more evident that this is indeed the case. The two seminal articles which predicted and defined the Trump Phenomena are America’s Ruling Class — And the Perils of Revolution, by Angelo M. Codevilla, and The Return of the Middle American Radical: An intellectual history of Trump supporters, by John Judis.